Kristin’s Favorite Blogs – Cats, Chocolate + Commas. My all-time favorite blog is Humans of New York, or HONY, a photoblog of (mostly) New York City residents run by Brandon Stanton. The project started in 2010 with Stanton taking pictures of people he met on the street and then it evolved into him becoming a quasi-journalist where he asks questions of his subjects, along with taking their photo. HONY has more than 12 million likes on Facebook (to me, that’s a lot for what started as a little ol’ blog), raised millions of dollars for individuals who have shared their stories, and creates campaigns to change the world. It’s also a book now too. It’s tricky to classify this blog. 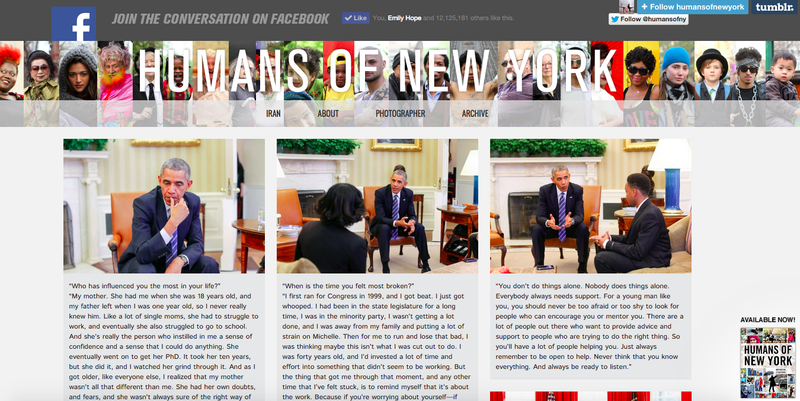 Initially started as a recreational endeavor, I would say HONY is a now professional blog. Yet Stanton doesn’t get paid to take people’s pictures (I don’t think); he does get money from the HONY book and other projects he does though. This one-man show posts several times a day and has millions of subscribers on all platforms. 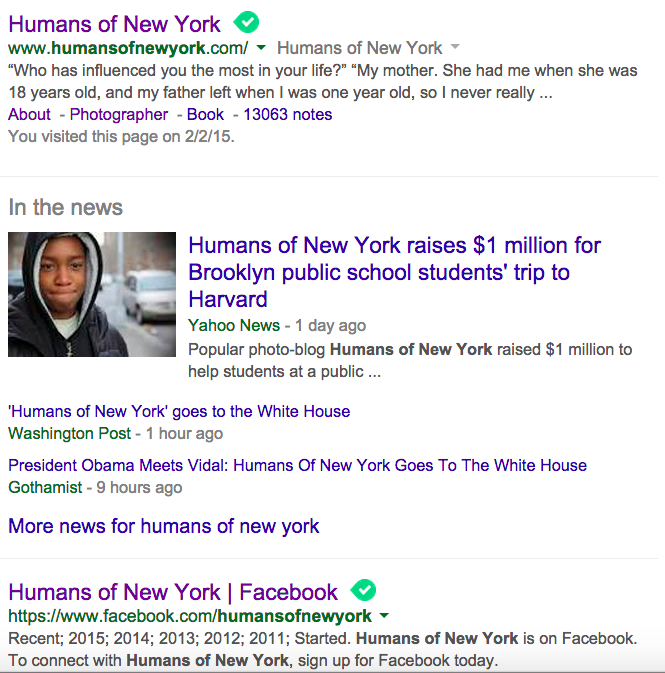 Although HONY’s blog, hosted by Tumblr, appears at the top of Google’s list, I think most people are driven to the website from social media. Stanton’s photoblog is overwhelmingly successful. As per this week’s lecture, HONY provides original content, often, as well as many ways to connect with the blog/Stanton from social media to a personal email address. The blog was not on eBizMBA’s list of “Top 15 Most Popular Blogs,” but it’s pretty popular — I can assure you of that. There’s even a Humans of UF page. One thing Stanton doesn’t seem to use is email marketing. I can’t find a sign up button on the blog anywhere. The only advertising on the site is for the HONY book. Some potential advertisers could be for camera companies, such as Kodak, or humanitarian organizations. My other favorite blog is PostSecret. People anonymously mail in secrets to Frank Warren and he posts them on his blog, hosted on WordPress. 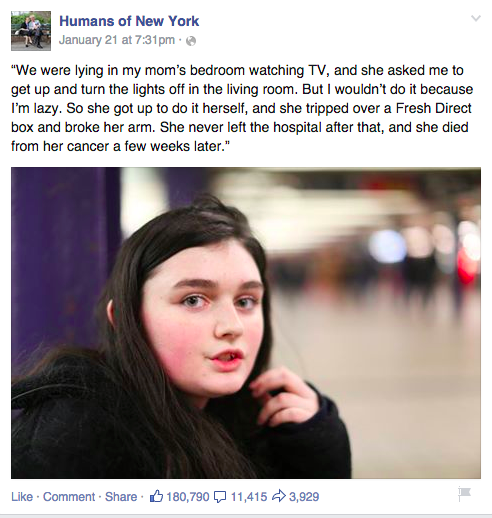 In contrast to HONY, you never learn whom these secrets belong to. But similarly, this started as a recreational blog in 2004 and after its success became what I would characterize as a semi-professional blog. Warren is the only person involved in the project and updates the blog with secrets every Sunday. He has obtained much success from it — published several books and travels all over the U.S. to give talks, meaning it is somewhat revenue-oriented. I wish I could find if he has a day job and what it is. From the posts, I can tell he’s very interested in mental health, so I wouldn’t be surprised if he were in that field. I think the appeal to the blog is that it’s total ly anonymous; a lot of people find it cathartic and the postcards are always interesting to read. After PostSecret, Whisper, Secret and Yik Yak, other anonymous apps and sites, started popping up. My undergraduate college has a Facebook page called Bing-U Secrets modeled after it (right). 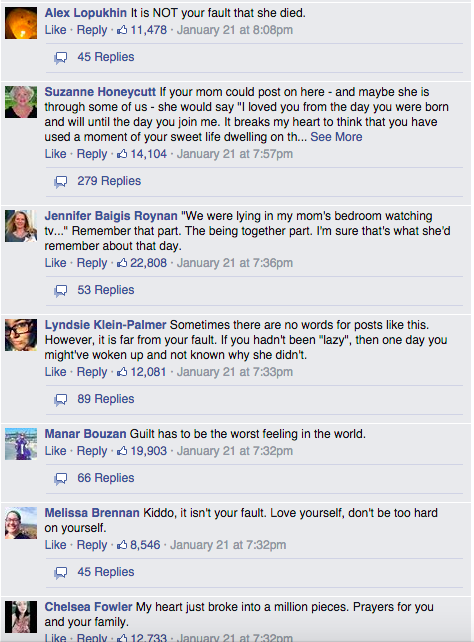 Whereas HONY puts the same posts on all platforms, PostSecret teases users to its website by not sharing the secrets on social media. This is smart and has led to high SEO, directing traffic to the blog. On the blog, there are also Twitter and Facebook feeds to bring users to the social media pages. 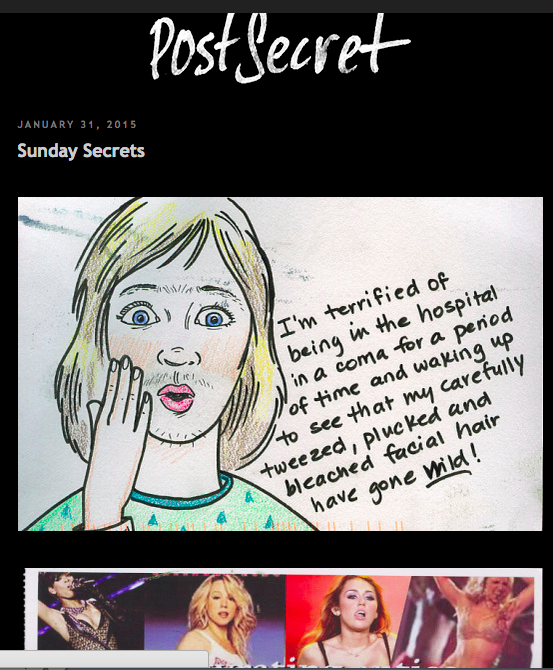 Something I didn’t know, you can sign up to get PostSecret News directly to your inbox, further adding to the IMC mix. The emails would probably include updates about tours and books. At one point, there was a PostSecret app, but it was discontinued as a result of “malicious” posts (Hernandez, 2012). PostSecret’s blog advertises its own products: a PostSecret album and a book. But there is also an International Suicide Prevention wiki link. Potential advertisers could be mental health organizations. One thing I would like to change (but in reality wouldn’t!) is the frequency of posts: I wish Warren posted secrets more often as he receives thousands in a year, but that’s what keeps people like me coming back for more! The homepage has social buttons listed on the side to share the blog and connect with Kate on these different platforms. She has Facebook, Pinterest and Instagram, but no Twitter. You can also subscribe with your email address to receive updates. I’d say this is a semi-successful blog though, since Kate doesn’t update that often. Under the “Product review” section, she has one post from November and hasn’t written another review since. Drizzle Me Skinny’s Facebook only has about 5,000 likes so chances are many people have never heard of it, unlike HONY or PostSecret. The things that really annoy me about the blog are the grammar and spelling mistakes EVERYWHERE. Most of the time I just look at the pictures and disregard the text because it’s so bad (as you could probably tell from the above quote). I think Kate could do a lot of things with this blog, such as have guest posts from people who are struggling to lose weight or with success stories, which would inspire others and ensure readers that they’re not alone. She could write up more reviews of products. Since she is a Weight Watchers member, the organization could advertise on her page, yet I think she would need to acquire a larger audience first. 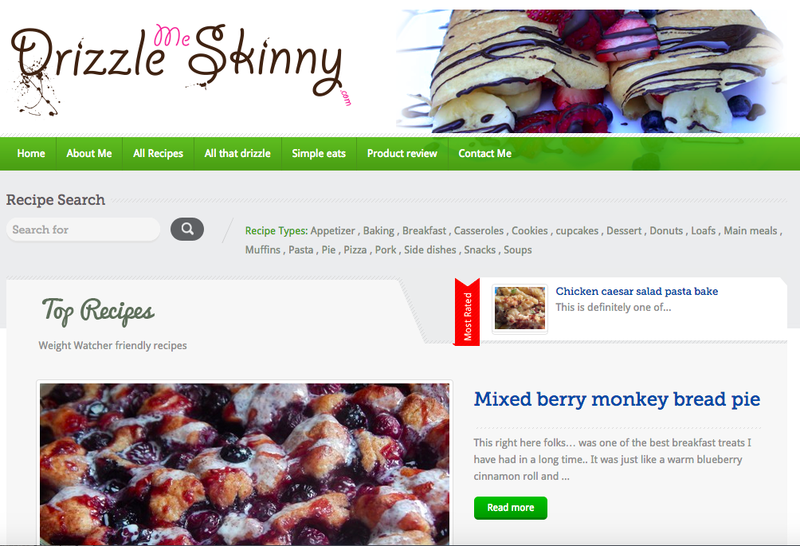 Food companies, such as Betty Crocker, could also advertise on the page. But again, Drizzle Me Skinny needs to get more followers.